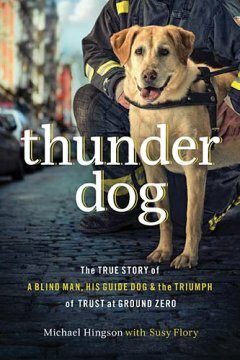 Thunder Dog: The True Story of a Blind Man, His Guide Dog, and the Triumph of Trust at Ground Zero by Michael Hingson and Susy Flory is a story of trust and survival during one of the most horrific experiences that has faced America. Michael Hingson’s and his guide dog Roselle wake up like any other day and prepare for their day ahead, which consisted of working on the 78th floor in the North Tower of the World Trade Center. Little did they know that their day would not end as expected. The bond that Michael and Roselle have is unique and allows them to work as a team as they face many obstacles during the 9/11 terrorist attacks. Being blind may seem like a barrier to the sited, but Michael breaks the stereotype of being blind and shows that being blind is not a handicap. This book is a thumbs up for inspiring not only the blind, but sited to chase your dreams and never let others tell you what you can and can’t do. Michael’s story is one that will inspire generations to come. Throughout the book, Michael eludes to their being a higher purpose to his life besides being blind. The trust that Michael and Roselle have for one another parallels the trust that we should have with God. This book was a fast and easy read. I think both adults and older youth will enjoy reading a true story of courage and trust.